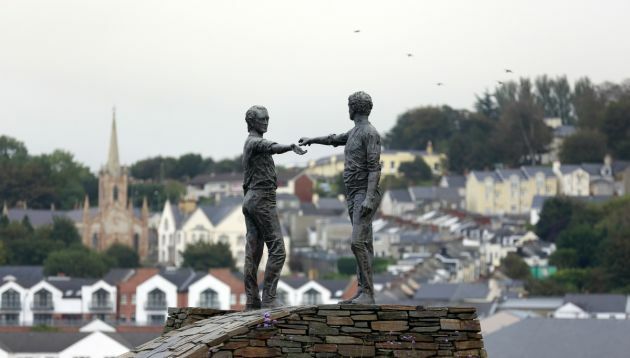 (Photo: REUTERS / Cathal McNaughton)The "Hands Across The Divide" peace statue by a local sculptor Maurice Harron stands in front of a backdrop of the Waterside area of Derry City, also known as Londonderry, in this October 3, 2013 picture. While cars burned on the streets of Belfast this summer in its worst year of rioting for a decade, Northern Ireland's second city of Londonderry was filled with tourists as its once bitterly divided population celebrated a stunning rejuvenation. Derry is currently the UK City of Culture 2013. Picture taken October 3, 2013. BELFAST (Reuters) - A letter bomb addressed to the British government's minister for Northern Ireland has been found at the province's administrative buildings and made safe, police and politicians have said. A 1998 peace deal largely ended decades of violence in Northern Ireland between Protestants who want to remain British and Catholics favouring unification with Ireland, but divisions and tensions remain. "It was a suspect package containing a viable device, which was made safe at a sorting office at Stormont Castle," a police spokesman said Tuesday. Northern Ireland's First Minister Peter Robinson said the letter bomb was addressed to Theresa Villiers, who is the British minister for the province. The nearby Northern Ireland assembly was not sitting at time. Some remnants of the Irish Republican Army do not agree with the peace and power-sharing deal and several letter bombs have been found at administrative offices around Northern Ireland in recent days. The tensions run deep on both sides, and Protestants have rioted repeatedly in Belfast this year over issues including which flags are used on administrative buildings to the routes of their traditional parades. "Those responsible for sending this, and other devices, through the post have absolutely no regard for the lives of postal workers and staff working in offices," Robinson said. On Monday, British police said they charged four men and one woman with terrorism offences and conspiracy to murder following a joint operation between forces in Scotland and Northern Ireland. During Northern Ireland's sectarian conflict that began in the late 1960s, more than 3,600 people died, including more than 1,000 members of the British security forces.